Sewell Newhouse was born in Brattleboro, Vermont in 1806. His family moved to Oneida County, New York, when he was 14 years old. As a young man, he spent most of his time in the woods becoming well-acquainted with the local Native tribes. Under their guidance, he became a well-rounded woodsman, especially knowledgeable about the pursuit and capture of wild animals. Newhouse made his first steel trap when he was 17, crudely fashioned from scrap metal found in his father’s blacksmith shop. He learned how to temper steel from a family friend, and over the next 20 years, usually with a partner or a hired hand, he made many more traps and a few rifles, mostly selling to other local trappers. In 1849, Newhouse was approached by John Humphrey Noyes, who had just launched a communal living venture on the banks of Oneida Creek, a few miles from Kenwood, New York. The commune was a religious idea, intended to save mankind. It was based on the idea that a perfect life could only be lived if people sacrificed everything to the community’s interest. Newhouse joined Noyes’ Oneida Community, and there he continued to make steel traps in the old way, by hand. By 1855, the demand for Newhouse steel traps had grown to such an extent that the Oneida Community leaders decided to begin manufacturing on a much larger scale, and it became a major part of the business dealings of the Community. In the 1850s, Oneida Community produced a No. 5 and a larger No. 6 bear trap called “The Great Bear Tamer.” It weighed 50 pounds. 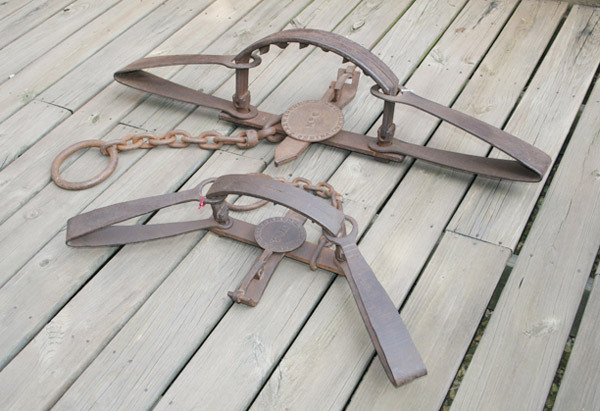 In 1864, the Oneida Community reported a yearly sale of 30 bear traps; that same year, they sold 7,250 beaver traps. While Newhouse bear traps were well-known, they never were produced in great number. The earliest model, called a slick pan, had no lettering on the pan. This trap was built in both the No. 5 and No. 6 size from 1850 to 1855. Next came the No. 5 & 6, with a lettered pan that read S. Newhouse Community N.Y. It was made from 1865 to 1888. Newhouse passed away in 1888, but the trap making continued, as has his legacy as America’s master trap maker. The pan on No. 5 traps made from 1895 to 1905 reads S. Newhouse Kenwood N.Y. At the same time, Oneida also made the No. 15, which is the same as a No. 5 but with offset jaws exposing the teeth between the jaws; two smaller bear traps, the No. 50 and 150, also went into production. During the Kenwood era, for a very short span, Oneida Community built a No. 25 and a No. 35, called the Newhouse Self Setting Bear Trap. It was not well received by trappers and was only on the market for a short time; these are very rare and prized by today’s trap collectors. From around 1895 to 1911, Newhouse bear traps had S. Newhouse Oneida Community N.Y in raised letters on the pan; they were built in sizes No. 6, No. 5, No. 15, No. 50 and No. 150. From 1911 through 1925, S. Newhouse Oneida Community N.Y PAT. Sept 26-1911 appeared in raised letters on the pans, and collectors refer to these as the patent date model; they were made in all of the same sizes. 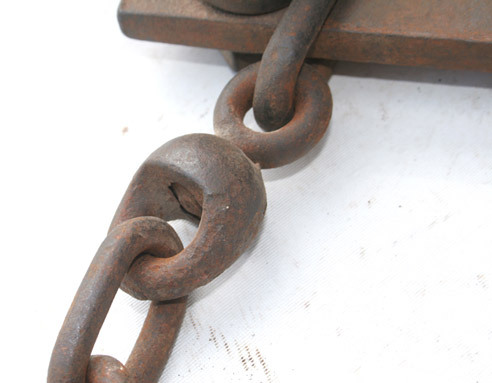 In 1925, Oneida sold the trap-making division to Animal Trap Company of America, Lititz, PA, where the Newhouse bear traps were continued in limited production through 1976. The raised letter pan now read Oneida Newhouse Reg.U.S. Pat. Off. Made in U.S.A., Animal Trap Co. Lititz, PA; they were made in sizes No. 6, No. 5, No.15, No. 50 and No. 150. The value of Newhouse bear traps varies greatly, but all are collectible. Condition and knowing that the parts are original is of most importance when buying these traps. A good No. 6 Slick Pan could bring $8,000 while a No. 5 or No. 15 might fetch up to $800. Much more information on Newhouse bear traps, accessories, and other bear traps can be found in a book Blaise Andreski and I wrote titled The Collectors Guide - Bear Traps - Model Recognition & Prices; it can be purchased from Sterling Fur Co., phone: (330) 939-3763.